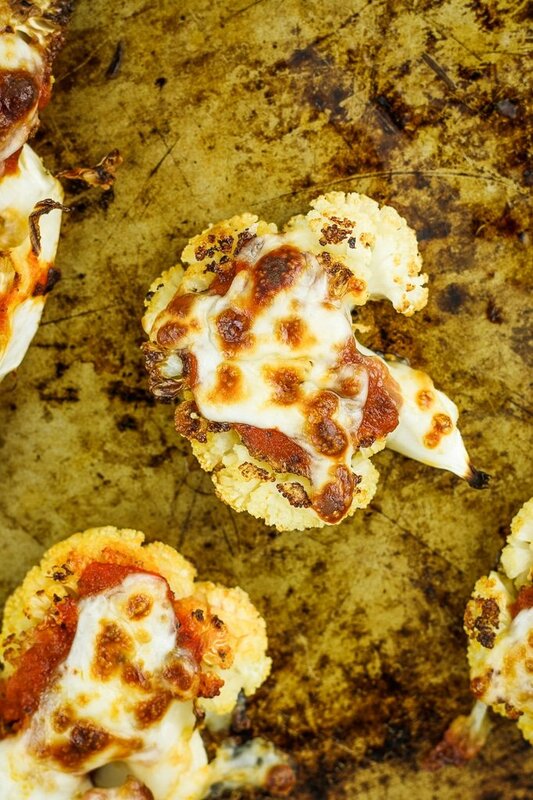 Ok. Hi there, cheesy crispy cauliflower pizza bites.  Made with straight-up cauliflower instead of cauliflower pizza “dough.” Yes, it’s magic. It’s easy, yummy, dreamy, healthy food magic and you guys are gonna LOVE it! I’ve been planning to share this cauliflower pizza bite recipe with you guys for about 3-ish weeks now. Actually, I’ve been chomping at the bit to share this recipe with you. But, uh… then the plague struck this household. 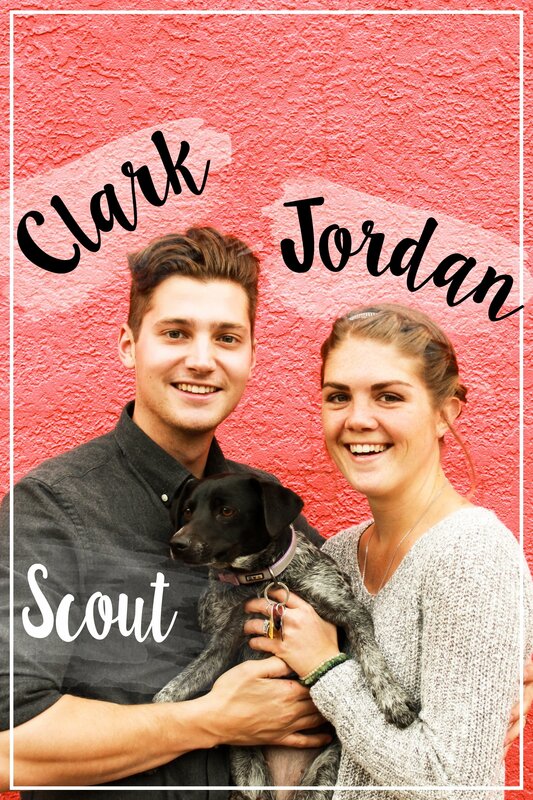 Clark went to Austin for a bachelor party weekend and then he got some nasty cold. Of course, despite all of my vitamin C and preventative measures, I got sick as well. Two weeks later, we’re finally feeling -close- to functional again. And theeeeeeeen, I made my first ever trip to the ER after waking up feeling like literal death one morning. The culprit? Low magnesium and sodium levels. How that happened, I do not know. Just don’t let it happen to you because it is absolutely zero fun. So anyway, enough about our rough start to October. 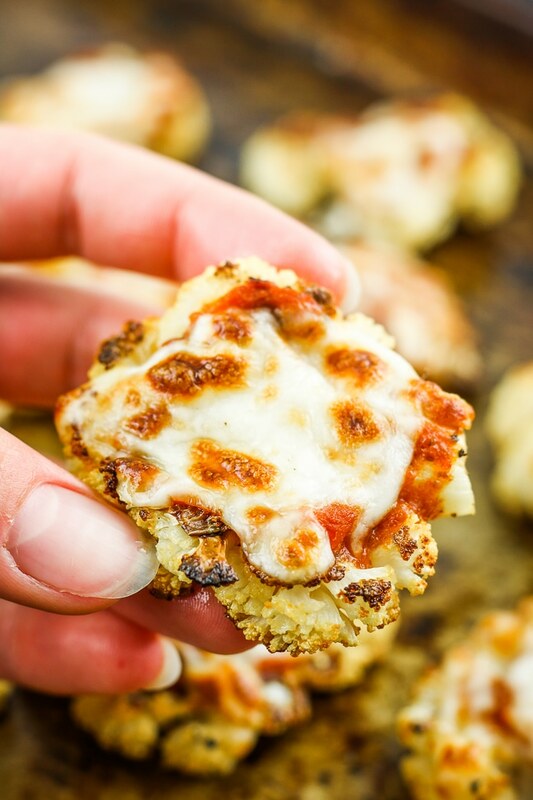  Let’s get to the real reason we’re all here today – ✨ Cauliflower Pizza Bites ✨. I know cauliflower pizza crust has been a “thing” for years and I love that, too. But this is just so much easier, so much more straightforward. There’s no steaming or straining or food processing or mixing. It’s just chop, top, and bake! 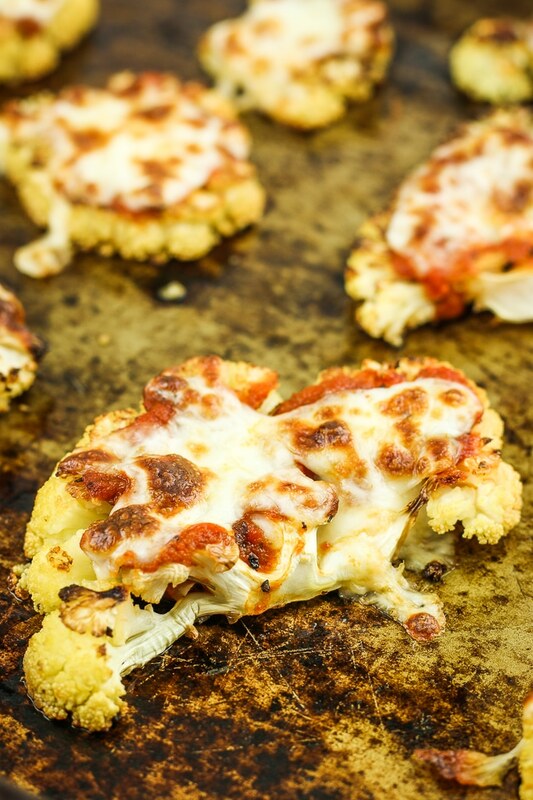 Then you get to enjoy amazing, healthy, miniature cauliflower pizzas! Preheat oven to 400º F. Line a large baking sheet with foil and grease lightly with olive oil. Prepare cauliflower by cutting it into large florets and then slicing it into thick cross-sections, like miniature cauliflower steaks. Arrange on the baking sheet and spritz or drizzle with olive oil. Sprinkle salt, pepper, and Italian Seasoning over the cauliflower and place the baking sheet into the oven. Bake 20 minutes, then remove the baking sheet and flip the cauliflower “pizzas.” Return to the oven and bake 5 minutes. Remove from the oven and switch the oven temperature to broil. Use a spoon to add sauce to the cauliflower, then sprinkle cheese over top. Return to the oven and broil for 5 minutes. Remove, allow to cool slightly, and enjoy! If it’s easier for you to use florets instead of slices, that’s perfectly fine! It may require a couple of extra minutes of baking time – just keep an eye on them while in the oven.